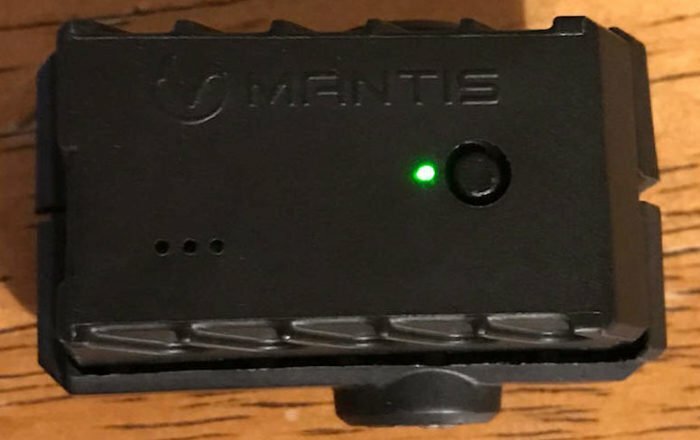 The MantisX sensor mounts easily to your firearm’s Picatinny rail. The MantisX Firearms Training System uses a compact mountable sensor designed to be attached to any Picatinny or Weaver style rail. The system acquires shooting data on pistols, revolvers, rifles, and shotguns, using Wi-Fi connections for real-time data. In addition, shooting strings are recorded creating a history of the shooter’s performance for review and analysis. movement immediately after the shot. The real-time data from MantisX can be used to analyze individual shots, or full strings of shooting. The feedback is based on a calibrated “zero” established by the MantisX system at the beginning of the set-up process. The MantisX sensor fits snuggly in the custom-cut foam liner inside the Pelican case. Most shooters have at one time been exposed to an instructor or training aid describing what is causing shots to go off target. These charts point out where the shooter is putting in too much or too little input into their grip or trigger squeeze causing the firearm (most often a handgun) to move during trigger squeeze and recoil. 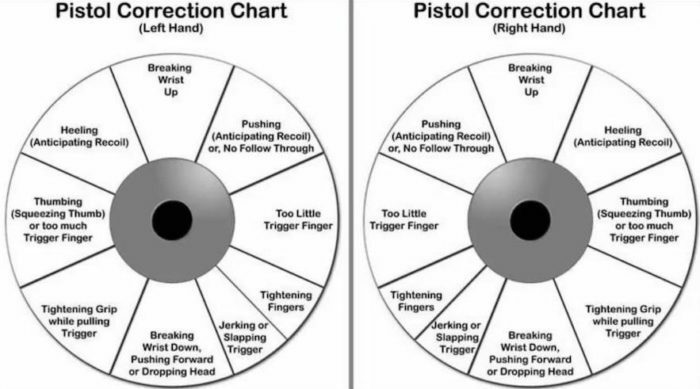 This “Pistol Correction Chart” is fairly common and standard in instruction (photo from YouTube). Though these charts are beneficial to make the shooter generally aware of why shots may be off target, the information is post shooting, and rarely provides a completely accurate assessment of what the shooter is doing to miss shots. For instance, these charts are mostly designed for one-handed shooting by the indicated hand. A 2-handed shooting stance really starts to interfere with the reliability of these charts, as support hand influence plays a big role. This is where the MantisX Firearms Training System really shines and outperforms most other guides on the market. The MantisX provides a shooter critical information on each individual shot – before, during, and after trigger break. 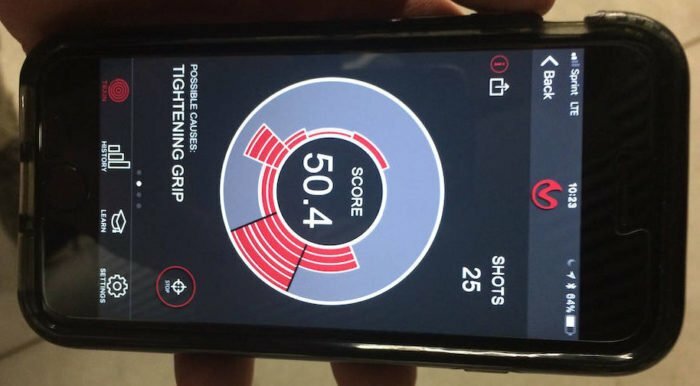 This information can be viewed after individual shots by instructors or shooters to identify areas of improvement. In addition, instead of simply dialing a shooter in for static, slow target shooting, the MantisX can be used in much more complex shooting strings as well. When body movement and displacement occur, multiple targets are engaged, and magazine changes are required, the MantisX can still teach the shooter critical information about their performance (see below). 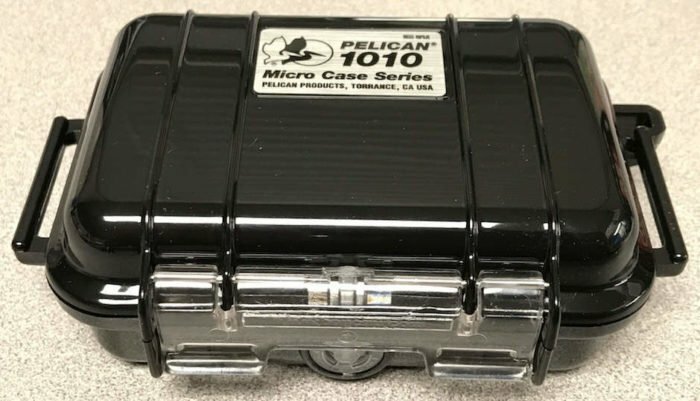 The MantisX kit includes: Pelican 1010 case, MantisX sensor, download cord, and (2) mounting screws. (1) Page of mounting, download, and operation instructions. The MantisX sensor sits inside a custom-cut piece of foam inside the Pelican 1010 case. The USB cord rests on top of the sensor and will allow the shooter to store recorded shooting sessions. The USB cord is also the method of recharging the MantisX sensor, so keep that in mind for a long day of shooting. The (2) included mounting screws will be stored underneath the sensor. The first is a simple standard-head screw, while the second is an enlarged head with ridges for hand-tightening. The second option is great for times when you may not have a standard screwdriver handy. Finally, a simple set of instructions is included. The MantisX Firearms Training System instructions are easy to follow. Download the app (MantisX) from the App Store or Google Play. Turn on the sensor by briefly pressing the button on the bottom of the sensor. 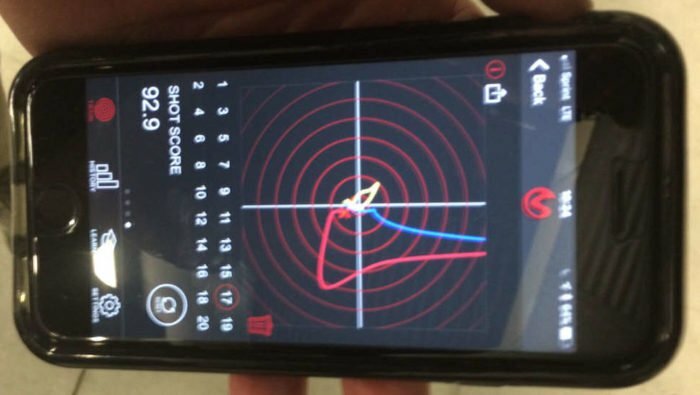 Open the MantisX app, and press “Connect.” Then leave the firearm stationary on a flat surface for a few seconds to allow the sensor to calibrate (zero). After calibration occurs, press the “Start” button on the app to start collecting data. When you’re done with a round of shooting, press “Stop” and begin analyzing your data. Press “Reset” between rounds of shooting to store previous data for review. To mount the MantisX sensor slide the sensor on the rails, align the slot, insert and tighten the screw. Most modern semi-auto handguns come with a rail system for mounting weapon lights or lasers. Simply slide the MantisX sensor onto the rail, align the slots, and tighten the selected screw until firmly attached. Some revolvers have a rail attachment, but others may require some gun-smithing to be able to use this system. Most modern rifles and shotguns have the ability to mount Picatinny or Weaver rails, which can then be used to secure the MantisX. A great advantage of the MantisX system is the ability to mount the sensor on any side of the firearm. 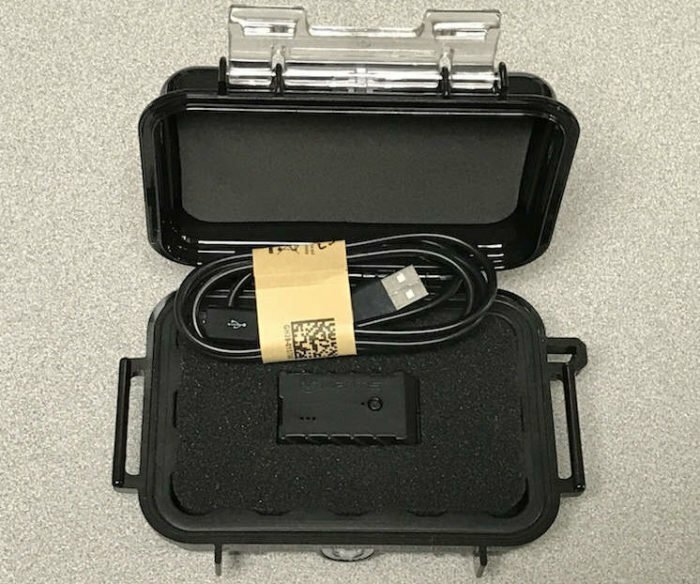 The MantisX app will ask where the sensor is located, and then will adjust readings accordingly to ensure proper “zero.” The sensor can be mounted facing either direction. The “Forward” mount is when the USB port faces the trigger guard. When the USB port faces away from the firearm it is the “Backwards” mount. The MantisX MagRail is another mounting option if your firearm does not have a rail. If you have a semi-auto pistol without an incorporated rail you can use to still take advantage of this system by using the MantisX MagRail. 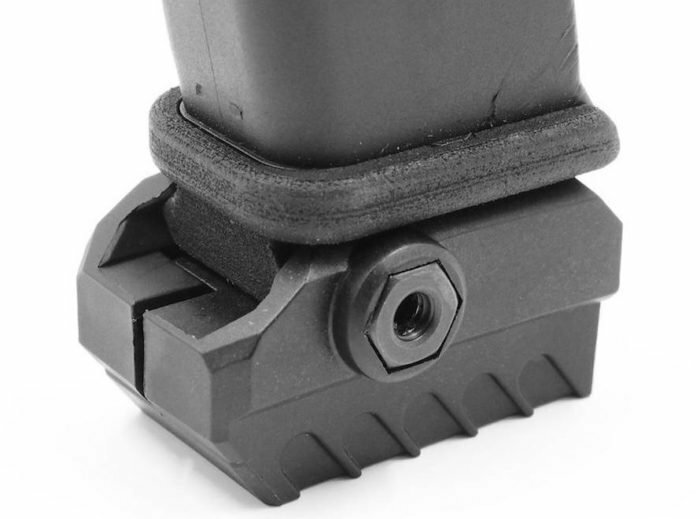 This is a universal Picatinny floor plate for your pistol magazine, and allows the MantisX sensor to mount onto the bottom of your magazine. The MantisX MagRail is an extra cost, but costs less than $11.00 by clicking this link. The light on the MantisX sensor will flash green, until connected to the app when it remains on solid. Green LED – Sensor is fully charged. 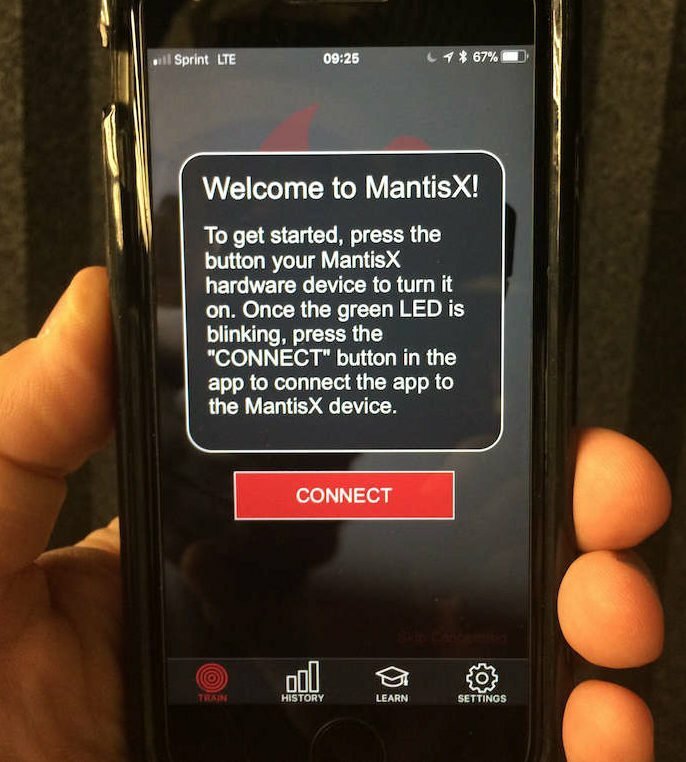 Once the MantisX App is loaded onto your device, simply press “Connect” after turning on the sensor. The MantisX system requires their free app, which can be found at the App Store or Google Play. Once downloaded to your device, press the icon to turn on the app. When the MantisX sensor is on, press the “Connect” button on the MantisX app to sync them together. Once the app is synched to the sensor, the sensor’s green LED will turn solid green instead of flashing. The app will then instruct the shooter to place their firearm (with the MantisX sensor attached) on a level surface for a few seconds to calibrate. 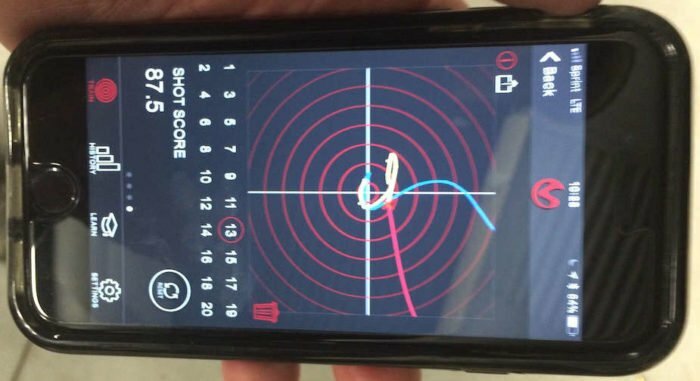 Calibration creates the “zero.” The MantisX app will then instruct the shooter to press “Start,” and the system is ready to record and analyze shooting data. The “Train” function is the fun part – shooting. As the shooter fires, the MantisX app will receive data from the MantisX sensor attached to your firearm. Individual or groups of shots can be viewed and analyzed, since the information is received immediately after each shot. Support hand only – precision one-hand shooting with support hand, timed. Each one of these pre-set training sessions has an attached video to explain and show the drill to be performed. More details on “Train” are covered in the next section. “History” is the recordings of previous shooting performances. After a string of shooting the shooter can press “Reset” on the MantisX app. This stores data from the first string, and prepares a separate record for the next string. Scores are both numerical, and mapped dots on a simulated ringed target. A running total is listed at the top of the screen. Individual sessions are dated and timed, and includes the number of shots and average score (out of 100) below the mapping target. A “Filter” option is available at the top of the screen, allowing the shooter to refine their study even further. The shooter can select their right or left-handed shooting, firearm type (handgun, rifle, etc. ), and even live from dry-fire training. “History” can be downloaded to your computer or other storage device for ongoing review using the provided USB cord, allowing shooters to evaluate their scores after making adjustments and compare them with previous records. In the “Learn” section, the user will find a classic shooting wheel divided into sections. Touching one of the sections will reveal both a picture and narrative explaining the shooting error, consistent with shots landing in that section. In addition, the method to correct this shooting error is explained as well. In “Settings” the individual shooter tells the system how they plan on shooting so even more specific data and analysis can be provided. This includes the type of firearm being used (even entering the make/model/caliber), and which hand you will be shooting. Options for live-fire, dry-fire, and even CO2 firing (Airsoft) are provided, so the system can calibrate accordingly. Where the sensor was mounted and in what position (forward or backward) are the final specifications. In “Advanced Settings” the user can change shot detection from “Normal” to “High.” Additionally, you can mark “Bullseye Mode” on or off. This will help achieve better results from either slow and well-aimed shots, to more dynamic shooting. 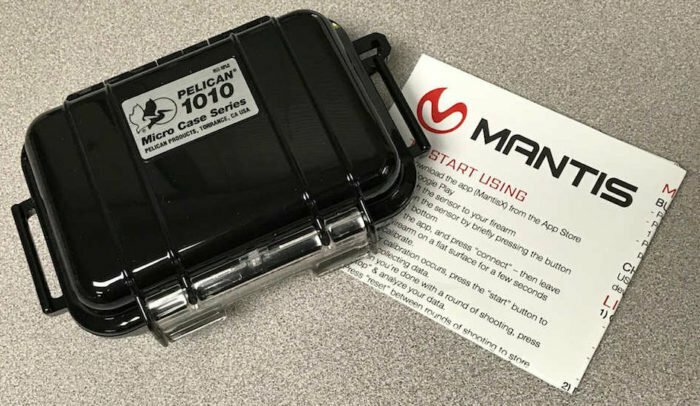 The MantisX System comes in a Pelican 1010 micro case, perfectly rigorous for range duty. This shot scored 92.9, and you can see my trigger pull point of aim (yellow) remained very centered. The “score” for each shot is based upon how consistent the shooter maintained their firearm during trigger pull in comparison to the MantisX sensor’s leveled zero. Think of it as the sensor monitoring a laser’s position on target, just without the laser. The closer to the sensor’s “zero” when the shooter fires their weapon, the higher the shooter’s score (out of 100). MantisX developers advise a perfect 100 is almost impossible due to the shooter’s natural arc of movement, so don’t go crazy trying for 100! The “direction” for each shot is determined based upon where the barrel was pointing prior to, during, and after the shot. This information is then sent to the app for recording and will show up in two graphs. The first graph is like a laser pointer recording of the firearms movement during the phases of trigger pull. 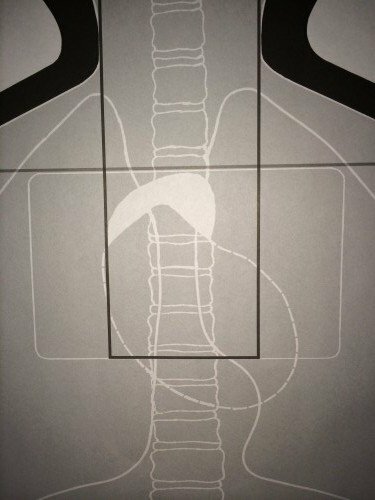 The blue line indicates the movement of the firearm while being held prior to the shot. The yellow line indicates movement during trigger pull and firing. Finally, the red line indicates firearm movement after the shot has broken. This type of information really helps the shooter or instructor understand any deficiencies in grip, stance, trigger pull and more. Here my score was only 87.5, and you can see more movement during trigger pull (yellow line). Here I’m shooting with the MantisX during a multiple target drill. The examples in the pictures above were from a string of rapid fired shots. The blue lines indicate I was bringing the handgun back down onto target fairly consistently. The yellow line indicates once I was on target I did a pretty good job of maintaining an accurate aiming point while squeezing the trigger. The red line reflects recoil and movement of the pistol after the shot. Considering the shots were rapid fire, I’m pretty happy with this string of scoring. It’s interesting to see the movement after the shot breaks is first to the right, and then upward. 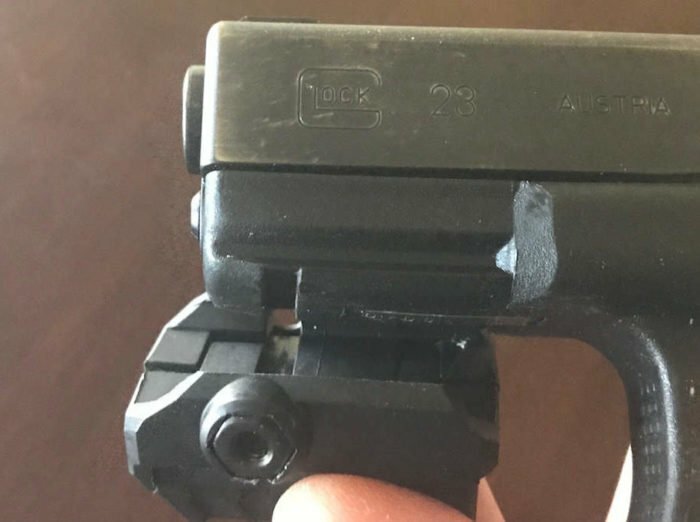 This tells me I’m putting a little extra squeeze in my trigger hand, and it will eventually affect my ability and speed to get the pistol back onto target for follow-up shots. Overall though, the MantisX showed I was moving the pistol in a fairly centered manner, and was able to lock onto my target and squeeze off a round with good shooting fundamentals. Overall this string of 25 shots scored 50.4, with most of my shots down and to the right (tightening grip). The second graph places lighted bars in the sector the barrel was pointing during the shot on the shooting wheel scoreboard. My 25-shot example above recorded most of my shots with the muzzle pointing down and to the right. My overall score of only 50.4 shows this string of shots was not very accurate to the “zero” obtained by MantisX sensor during calibration. However, there is some important information from the data above that would likely be missed if an instructor was simply relying on watching the shooter, and then examining the results based upon a paper guide. Though most of my shots are down and to the right, there are a significant number of shots showing down and to the left. This particular 25-shot string was a multiple target exchange, moving to and using cover, and incorporating magazine changes. This was also under time constraints. With all that movement there were times my support hand was putting too much input into the shot and that is when my shots went down and to the left (I am a right-hand dominant shooter). Now I have a much clearer picture of my shooting performance, and can even go back to individual shots (matched up to where I was at the time of the shot), and learn more about my body movement, and hand movement during those shots. With that information I can really start dialing in my weaknesses and start getting even dynamic shots on target more accurately! This type of information is often missed by other shooting aids, particularly the ability to analyze individual shots rather than just a group as a whole. The final piece of feedback from the MantisX system is the “Suggestion” on how to correct identified deficiencies. In the picture above MantisX has suggested the cause of my poorly aimed shots is “Tightening Grip.” This is located in the lower left area of my phone screen under the “Possible Causes.” I can now use this information to practice making shots without over-input from my grip, and then compare with the results from these strings of fire. Sure enough, I know I tend to get a little excited in rapid-fire and multiple-target scenarios, which leads me to tightening my grip a little too much during trigger squeeze. This information also lets me know I sometimes overcompensate with my support hand. This is a tendency I have to overcome, especially when I’m fighting the clock to get my shots finished. With this information I can begin to train these bad habits out of my shooting stance while on the range, and not out on the streets where it really counts! Here the MantisX provides information on muzzle direction during trigger pull, and possible causes. To move between feedback screens simply swipe left or right. 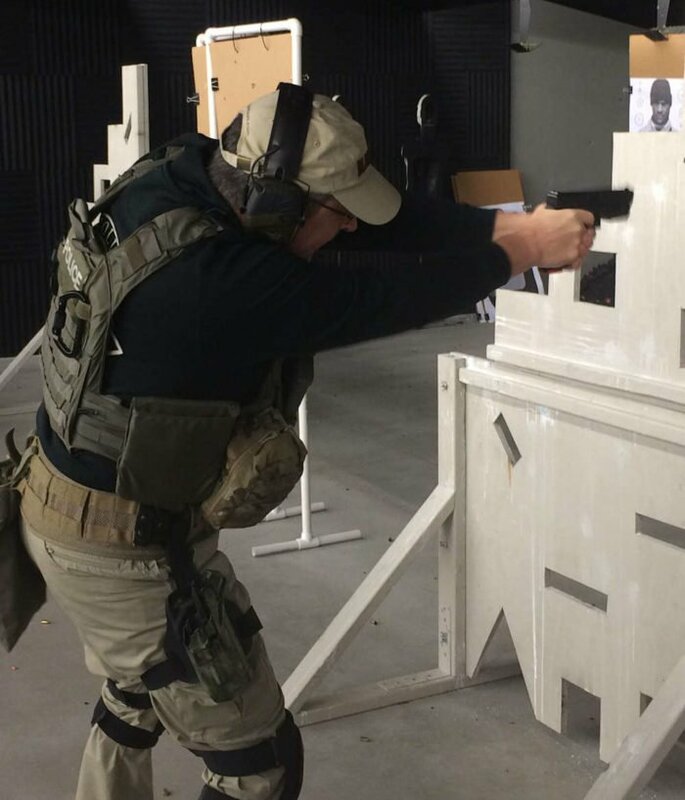 When I showed off the MantisX Firearms Training System to my local Range Master and Firearms Instructors, they all were intrigued but also curious about application. Once I began to shoot with the MantisX and we could see the results displayed immediately after each shot, they quickly began to see the benefits of using this shooting aid during instruction. By recording individual shooting scores, the instructors can guide a student shooter before and after each shot with much more clarity. Instructing the student to take shots one at a time, or in a slow and methodical aimed method, the firearms instructor can watch the shooter directly and then refer to each shots score and muzzle tracker. 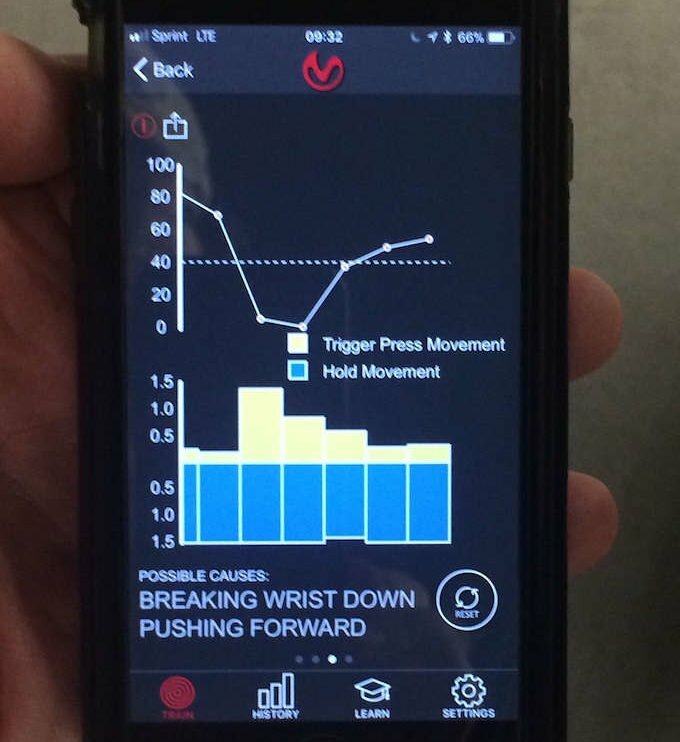 The instructor can pause the shooting cycle if the movement is too great, and spend time explaining the shooting errors with the student using the graphs from the MantisX. The collection of “History” is an excellent tool for instructors who work routinely with the same shooters. 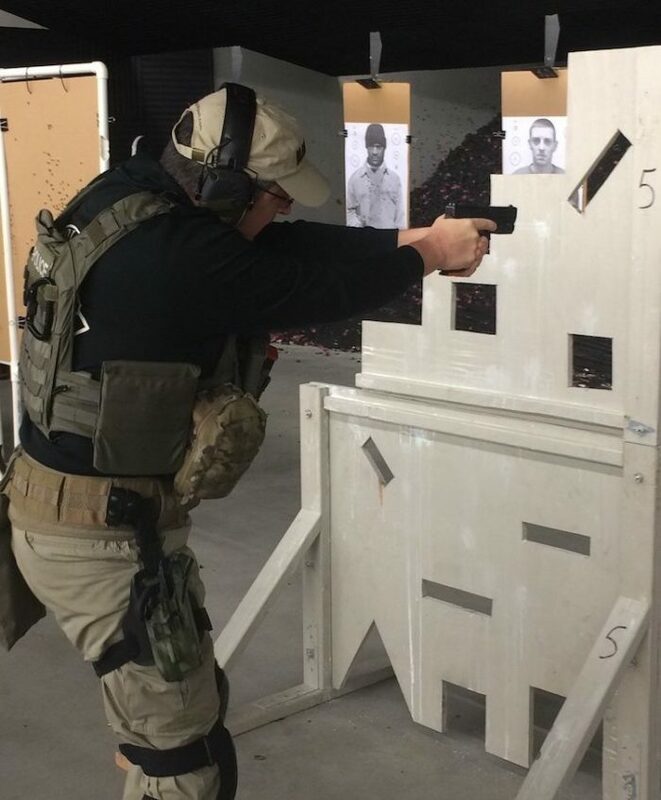 Prior to each new instructing session, an instructor can review previous shooting history and set a plan of action for more specified instruction based upon that individual shooter’s tendencies. Mastering the shooting fundamentals is key to accuracy. MantisX helps hone those skills. The real-time movement tracker is perhaps the most advantageous feature of the MantisX, and why it really excels over other options. The tracker allows the shooter to see how they are moving during the shooting cycle. Sometimes guidance from an instructor is not enough, or may be misinterpreted in some fashion. Showing the shooter their firearm movements allows them to see exactly how and why their input is effecting their shot placement. As the student improves it is also a great way to track progress. Whether you are a beginner or a seasoned shooter, starting off shooting slowly with well-aimed shots allows the MantisX to provide the most accurate information about shooter movement during the firing sequence. From those best-aimed shots, the shooter can learn the most accurate information on their deficiencies. The MantisX can be calibrated for left-handed shooters, but is less ideal for off-hand shooting. The MantisX can be calibrated for left-handed shooters, so there is no need to try to flip the results and make them fit into the right-handed shooter’s model. Though not designed for off-handed shooting, I found I could spend a little extra time analyzing the results and still gain good insights. The results are not exact though, so it’s best to simply use the MantisX when calibrated for one particular shooting style. Position shooting can be accomplished, and can identify shooter deficiencies in grip and muzzle control. Dry firing is an excellent form of firearms training. I know there some shooters who swear against it, and even some firearms manufacturers that caution against it, proper dry firing can produce amazing benefits to the shooters accuracy and completion of the fundamentals. 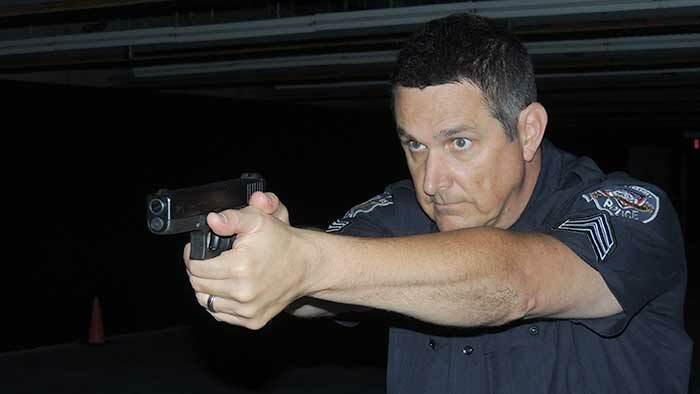 When properly conducted, dry firing can allow the shooter to see the movement in their firearm during trigger pull. 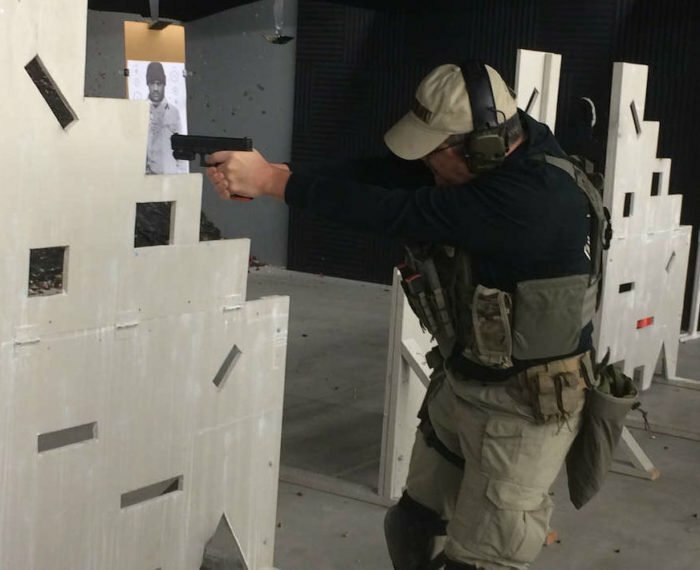 From the observed movement, knowledge can be obtained to correct the movement, to the point of nearly eliminating movement during the trigger pull. 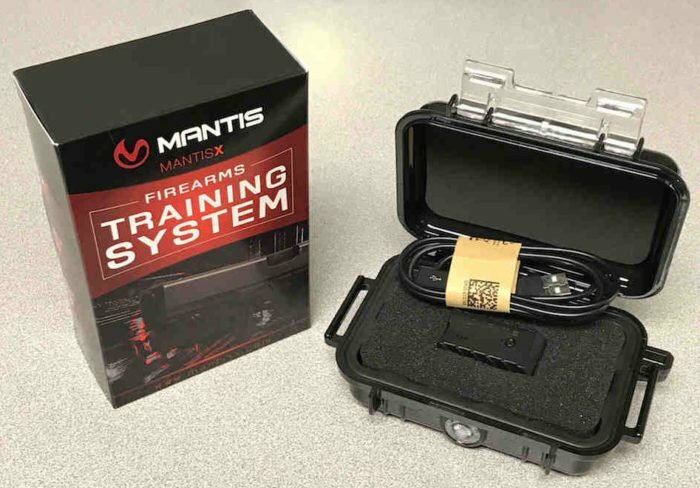 The MantisX system is particularly designed to provide feedback during shooting exercises, but the makers specifically mention dry-firing in the instructions. The ability to use the MantisX during dry firing is huge. In addition to simply watching for movement while practicing trigger pull, the MantisX will add incredibly detailed data and feedback to dial shooters in. 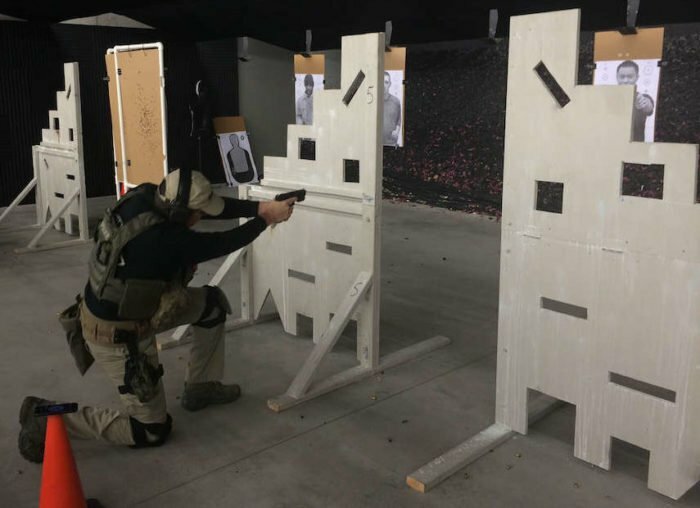 All of this training can be performed at no cost of ammunition, and in the comforts of home or the shooter’s preferred training area. The MantisX Firearms Training System has a huge potential for improving shooter’s ability to correct shooting errors and get better with the shooting fundamentals and accuracy. However, I did find a few potential limitations of the system. The MantisX relies on a calibration “zero” based upon the calibration of the firearm starting in a still and level position. Conducting static and well-aimed shooting drills allows the MantisX its best chance to produce high quality data and feedback. However, if the shooter is conducting more dynamic drills with more movement, the data requires much more effort for insight. For example, the 50.4 score (pictured before in this article) would seem to indicate a wildly inaccurate string of shooting. That was during the moving, displacing, magazine changes and multiple targets drill. However, two observers watching my shot placement noted my shots were striking within a well-defined target zone. The 4″x7″ white rectangular box was my aiming point. We use the F-TQ19ANT-MCSD target for qualifications, and targets with human picture overlay for other training. The white, rectangular box across the upper chest is the primary targeting area. My shots were striking in this area, despite my less-than-ideal shooting platform (and muzzle control) recorded by the MantisX. Obviously, being only 5-7 yards away is a big factor. In addition, it is quite frequent during position shooting (standing, kneeling, sitting, prone), or shooting around barricades, for the firearm and shooter’s body to be canted off to one side. Non-level angles can create a shooting platform misaligned with the original calibration, resulting in somewhat skewed results. Leaning the body, angling the firearm, and dynamic movement can mask your results from the MantisX. The MantisX Firearms Training System has proven to be a very valuable range tool. Even for experienced shooters, the MantisX will be able to record and identify any shooting weaknesses and provide good recommendations for correction. Unlike paper shooting guides, the MantisX data is much more detailed and useable only milliseconds after each shot. 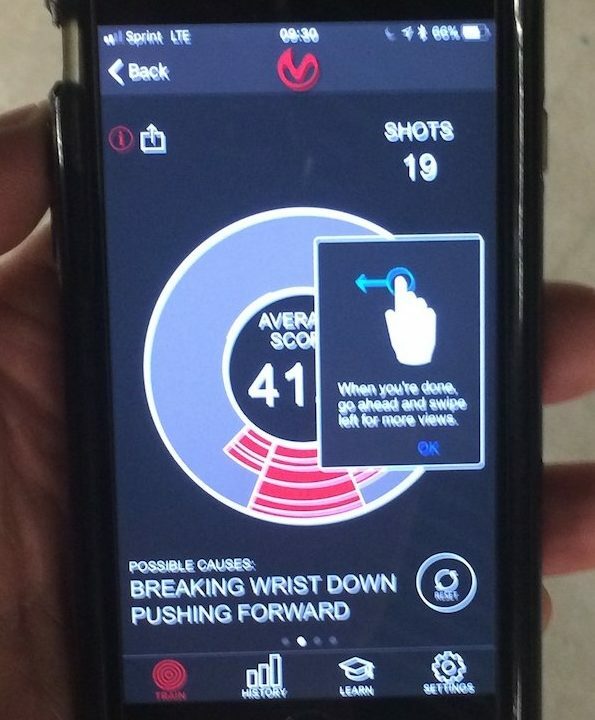 Shooters can monitor their electronic device for results after each shot. Instructors/observers can quickly point out deficiencies and remedies. Data can immediately be placed into action on subsequent shots for more accurate shooting. History logs are also an enormously beneficial feature. The MantisX allows historical review of problems, as well as your successes. Graphing allows shooters to track progress and set goals. Everything from slow and deliberate shots intended for accuracy and best results, to a full-on shooting, moving, and displacing drill, the MantisX was able to provide important feedback to help me understand my shooting platform. If you only shoot 1-2 times a year, and are happy if most of your shots hit the target somewhere, this may not be a tool for you. For everyone else, the MantisX could be the difference maker in better shooting fundamentals and more accurate shots. BlueSheepdog recommends the MantisX Firearms Training System. Michael, I am still using the Mantis X system and find the overall experience to be good. I understand the perfect 100 score is likely not attainable (even in a vice). I believe the Mantis uses a computerized gyroscope to keep track of movements. It is sensitive which likely means any input on the pistol (even in a vice) is likely to result in a “movement” sensory. 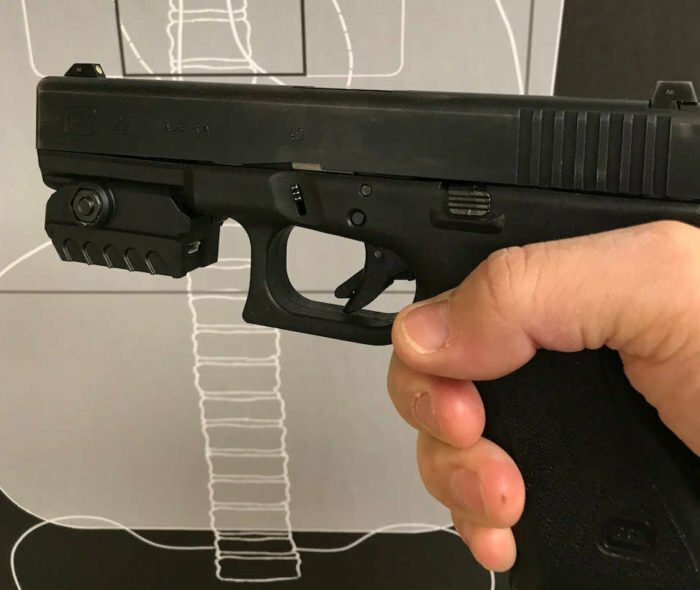 However, for dry fire and even static firing, the individual and group shot information can be very beneficial in identifying grip, trigger pull, and overall shooting errors. This can become even more noticeable when double-taps are attempted. It’s not a perfect tool, but I think it can be very beneficial in identifying shooter-induced errors – much better than simply a paper wheel guide. My problem is there is a difference between what MantisX shows me and the target. By Mantis I’m a quite good shooter with all time score of 94.6 while the score of my last live shoot was 97. I often get a single shot score of 99.8 or 99.7. I think I also got 99.9 for a few times. But the target is a different story. I don’t have such a good result while it’s true all of my shots are in black. And now I don’t know where to search for a solution. Andrew are you using the MantisX on a pistol? If so, what distances are you shooting when you’re scoring with MantisX? Also, what is your “black” area you refer to when your shooting? Is that simply the big silhouette on many targets, or a smaller bull’s eye of some kind? I’ll try to evaluate your issues with your answers, but you may need to contact MantisX reps directly to more thoroughly analyze the issue. 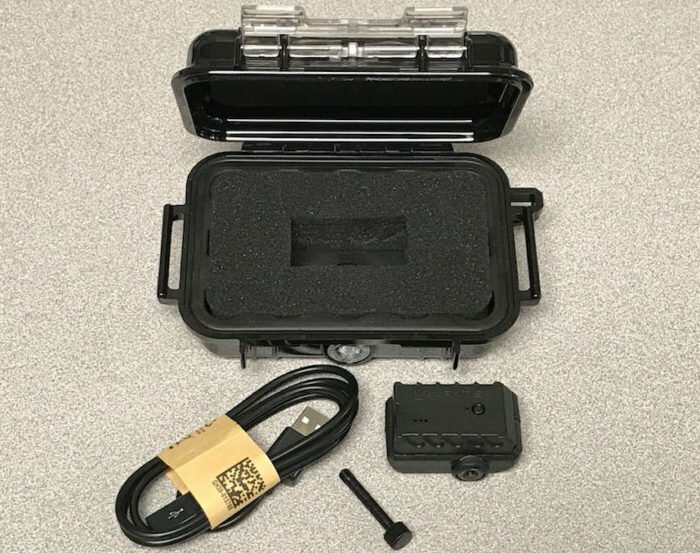 I would check to make sure the unit is firmly attache to your firearm, AND make sure it is properly identified in the MantisX computer system (location it is mounted, etc.). If you are shooting at a small “black” target area, and are more than 5-7 yards away, it could simply indicate that small movements (shown by your high score), have enough influence to cause the bullets to strike a few inches apart rather than a tight hole. Remember, handguns by nature are much less accurate than long guns. Just suggestions, I’m not sure exactly what is causing your issues. Also make sure you are keeping updated on the MantisX system upgrades. Since obtaining my system I think I’ve updated 3-4 times already.